Allegheny Surface Technology (AST) has been providing metal surface finishing services for over 20 years. Regardless of size or complexity, we will produce the optimal surface finish for your product(s) in our new state-of-the-art facility. If your application is too large to be shipped to us, we will come to you. Our on-site crews are ready to travel anywhere in the continental United States. Our expertise covers new installations and restoration of existing equipment to keep your project or production on track. If you are a new customer inquiring about a sample, send us a message or call us at (866)-266-9293 for more information. Allegheny Surface Technology has provided electropolishing services for over 20 years. Our expertise includes intricate one-of-a-kind parts as well as production lots, all serviced in our new state-of-the-art facility. Passivation is the chemical process that removes free iron from the surface of stainless steel for the purpose of enhancing corrosion resistance. 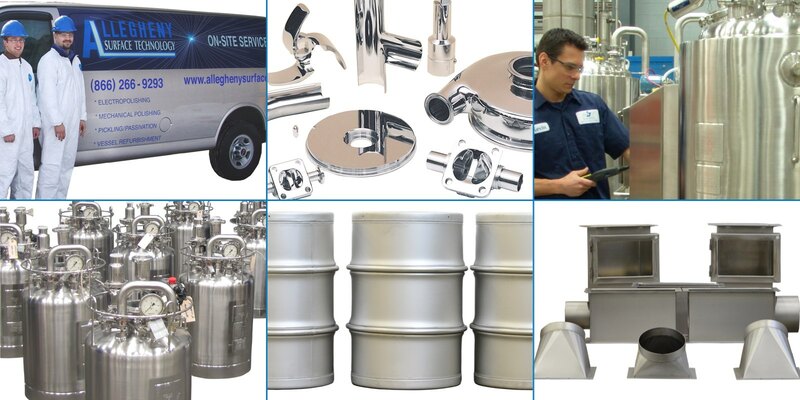 Allegheny Surface Technology offers either citric or nitric acid passivation based on your specific requirements. The mechanical smoothing and removal of contaminants. It involves grinding, polishing and buffing of the surface. Allegheny Surface Technology offers turnkey on-site services to address your refurbishment needs. Allegheny Surface Technology will inspect and evaluate the condition of equipment at your facility using our Qualified Level II Technicians.